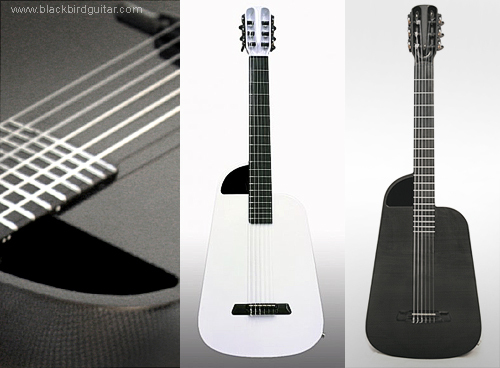 Blackbird Rider Nylon String travel guitar. Would you take your guitar with you to the Alps? Blackbird Rider is a light, compact, weather proof, and virtually indestructible travel guitar. The carbon fibre one-piece, hollow body, neck, and head construction, form the sound box for enhanced bass, sustain, and volume. Extended shoulder to 10th fret increases sound box air volume. Off–centre sound hole boosts effective size of the ultra–thin soundboard and increases tonal response. Innovative head–located sound hole projects sound from hollow neck to reduce standing waves. I think that you've done a great job on the design of this blog, it looks very sleek. It's great to see a blog where the users have such a great input to it. I'm looking forward to seeing how your blog grows in the near future.